The RBA is the first central bank to get the opportunity opine on the mess in Greece/Europe tomorrow, when it puts out its July policy statement. While the implications for Australia are likely to be very limited (particularly as the market seems to have taken things rather well so far today), it will no doubt get a passing reference. 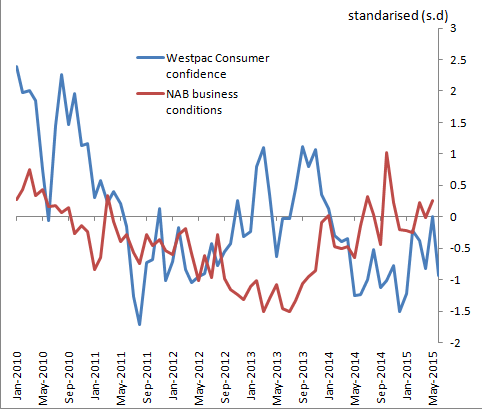 More importantly for the RBA, the domestic data have been a little confusing since the no change decision in June. Business conditions continue to bounce around their long-run average, but consumer sentiment has fallen back sharply. Somewhat surprisingly, the latest labour market data also showed some further improvement. The noise in the headline seasonally adjusted data has meant that the RBA has focused more on the trend over the past year or so, but it also seems to have stopped worsening (for now). On the exchange rate, it has fallen around 2.5% since the June policy meeting. While that decline is welcome, it still isn’t enough given the decline in commodity prices. Of course, immediately after the June policy statement the AUD rallied on disappointment at a lack of forward guidance on further rate cuts. Much of that was soon unwound (with the minutes and speeches), but there is probably some risk again this month an easing bias is not re-introduced. Countless market and media antennae are trained on the sound of the central bank voice, trying to discern and amplify signals out of all the static around, even when the central bank has no new signal to send, and static is all there is. That leaves the RBA on hold, for now at least. I still think that one more cut is likely this year, but that will probably be it. Somewhat remiss of me not to mention China. Clearly there are some issues around the stock market, and the policy makers are now stepping in to try to stabilise things. But I doubt this will be a big deal for the RBA, unless it looks like it is becoming systemic (not impossible given the leverage apparently used). Rather they will be concerned about the ongoing slowdown in activity there, and whether it remains steady.